May 11, 2018 (Raleigh, NC) – Due to scheduling conflicts, Trig Modern, Baum Shelter, and SAFE Haven for Cats have postponed The Cat’s Meow charity auction and party to Thursday, June 7th. The event will be held from 6 – 8 p.m. at Trig Modern, 1053 East Whitaker Mill Road, Raleigh, NC. Featuring entertaining auctioneer Ben Farrell, The Cat’s Meow is an annual auction of cool, modern, indoor “houses” for cats created by architects, artisans, interior designers, and other professionals. All proceeds go to SAFE Haven for Cats, a non-profit, no-kill shelter and low-cost clinic in Raleigh dedicated to caring for and finding homes for thousands of homeless cats and kittens, many of which have been abandoned and need veterinary help as well as permanent homes. 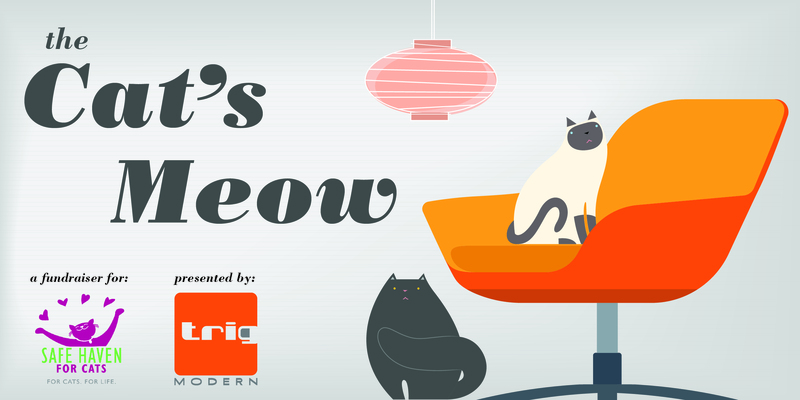 Hosts for The Cat’s Meow are Bob Drake, owner of Trig Modern furniture showroom and design center, Ann Marie Baum of Baum Shelter, a new interior design firm in Raleigh, and Pam Miller, founder, president, and CEO of SAFE Haven for Cats. Completed cat houses should now be delivered to Trig Modern by June 6th. Anyone interested in designing a cat house, donating another item for auction, or providing in-kind donations should contact Ann Marie Baum as soon as possible either by phone (919.971.5450) or email: annmariebaum7@gmail.com. Follow The Cat’s Meow 2018 on Facebook. SAFE Haven’s mission is to ensure the well-being of every cat through adoption, affordable spay/neuter services, community outreach and adherence to no-kill principles. The shelter receives no government funds and relies solely on private donations for 84 percent of its budget. Visit safehavenforcats.org for more information. Click here to see Dwell Magazine’s coverage of the 2017 cat houses. Fine furnishings from the “My Carolina Today” set are available to the highest bidder. November 8, 2010 (CARY, NC) – The contemporary furniture that has graced the set of NBC 17’s morning show “My Carolina Today” for the past three months is about to be sold to the highest bidder. Nowell’s Contemporary Furniture in Cary is holding an auction of the furniture the store provided for the TV show’s set. Proceeds will benefit Multiple Myeloma Cancer Research at Duke Medicine. Bidders can click on images of the pieces for more information then place their bids on the site. The auction will continue through December 31st. “Buy It Now” prices are also listed for each item. The contemporary furniture store’s owner, Jerry Nowell, was diagnosed with multiple myeloma in May. Since then he has teamed with the Duke Comprehensive Cancer Center to help raise funds for cancer research at Duke Medicine. Multiple Myeloma is an incurable cancer of the plasma cells in bone marrow. It is diagnosed in approximately 20,000 new patients every year in the US, and the illness claims the lives of nearly half that number annually. 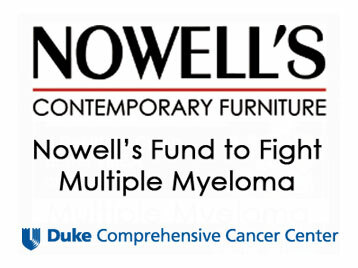 “One hundred percent of the sales of the ‘My Carolina Today’ furnishings will benefit multiple myeloma research at Duke Medicine,” he stressed when he first announced the auction on a segment of the show that aired Monday morning, November 1. An in-store fundraiser will also be announced later this month.